Art Donovan is an extraordinarily talented designer with a flair for steampunk aesthetics. 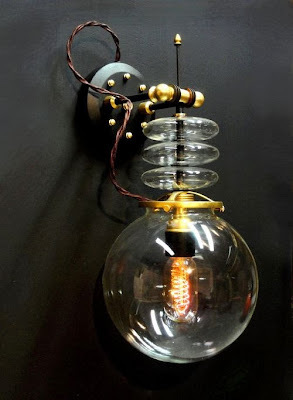 He brings these talents and sensibilities to bear on the design and fabrication of incredibly detailed and beautifully constructed lamps, lights, clocks, and mechanisms. Donovan is also a leading chronicler of the steampunk subculture; in a post last year we featured the first edition his book, The Art of Steampunk, which featured not only his work, but that of other excellent artists and craftsmen in the steampunk scene (a revised second edition was published this past summer, see our Amazon link below). Shop Amazon - Get 20 Off at Checkout on Jewelry. Save up to $200 on Select Styles Purchased with the Amazon.com Rewards Visa. I am an electrical engineer with a wide range of interests. Like most people, I want to do work that I have a passion for.